Pulse – This Australian film was part of the “ImageOut There!” series, it definitely took some interesting twists and turns. What if people could surgically switch bodies, like for example go from a disabled teenaged male body to a “picture perfect” teenaged female body? This is what Olly chooses to do, with his/her reasonings unfolding slowly throughout the movie. A different and unique perspective leaning a little too heavily on the fantasy of what it means to be a woman: not much insight but plenty of pitfalls. Man Made – This may be my all time favorite movie I’ve seen at the festival over the years. I cried a lot (and that’s saying something because lately tears are super hard to come by!) It’s a documentary that follows the journeys of 4 transgender men as they prepare for the only all-trans bodybuilding competition, in Atlanta, GA. Their stories are heartwarming, heartbreaking, and they hit on a bunch of emotional points in between. Studio 54 – I didn’t really know anything about the behind-the-scenes, so I learned a lot! The documentary featured a lot of interview time of the more “silent” partner, Ian Schrager (the more public partner, Steve Rubell, passed away from AIDS / hepatitis in 1989.) My spouse pointed out that it was a smart idea not to rely on a bunch of famous people being interviewed about it – that seemed like the easy choice, but this way the film spoke for itself a lot more. This year was the 25th anniversary of our local annual LGBTQ+ film festival! We made an effort to invite friends to different films this time around, which was fun – connecting with some people we hadn’t seen much lately was nice. Most of these links are to trailers, and a couple are to the films’ websites. Beach Rats – I went to this one by myself, and I was surrounded by gay men, for the most part. There’s something about that that I really embrace; it doesn’t happen often enough. The general story-line is that this young man is living a double life – hanging out with his friends drinking, smoking pot, playing handball, going to Coney Island, getting a girlfriend. When he’s by himself though, he turns to online websites to hook up with older men. I like the way it was filmed. Really sparse. And the story-line takes an unusual twist. Tom of Finland – This is the Finnish entry for best foreign language film for the upcoming Academy Awards – how cool is that?!! This was a really well done bio-pic. I really didn’t know much about him other than what I saw of his drawings. He fought in WWII. He had a complex and interesting relationship with his sister. He had a long-lasting partner. He had fans all over the world, but especially in California, and they made sure he knew he was celebrated, flying him in for parties he inspired, etc. Highly recommend! The Death and Life of Marsha P. Johnson – You can watch this movie on Neflix if you want. So, this is really only some of the story. There is a lot of controversy surrounding the production of this film and who’s work is being credited, which we only found out about the day before we were going to see it. Here’s one article that gets into all the details: What Would Trans Art Look Like if it Was Only Made By Trans People? To sum it up in one sentence, a trans-woman of color – Reina Gossett – has been working on a film about Marsha P. Johnson, and she had done a ton of legwork and archival studying. Then this dude – David France – swoops in with his finances and his connections and essentially steals the work that had been made thus far. So, our experience was a little bit soured, but I have to admit it was still a good film. And I hope Reina Gossett is still feeling empowered to move ahead and create her own film – the more films that will educate people about transgender people and issues, the better. I just realized I didn’t say anything about what this film is about – so go watch it on Netflix! Haha. Alaska is a Drag – This one was kinda campy. It features twins who are stuck living in Alaska – a gay guy working at a fish cannery, learning boxing, and fantasizing about making it big as a drag queen, and his sister who has cancer and is getting regular treatments, but her spirits are high, indulging in the world of drag her brother creates. It was so-so. Definitely different, but not all that compelling. Freak Show – This was SUPER campy. Directed by Trudy Styler (Sting’s wife!) A kid has to move to a southern state and attend a super conservative high school. His mom is Bette Midler, er, I mean, a mom played by Bette Midler. He endures bullying on top of bullying and hate crimes and more and more violence. He then decides to up the ante and run for homecoming queen. Laverne Cox has a small role – that was one of the best parts. Also, costuming was stunning, but otherwise, I wasn’t a huge fan. Saturday Church – This centers on a 14 year old boy named Ulysses. Similar themes as Freak Show, but the approach is a little more realistic. He starts to question his gender identity amidst bullying at school and conservative viewpoints from relatives. He meets other gender variant people of different stripes, they all convene at a youth service / shelter on Saturday nights. Kate Bornstein plays the person in charge of the space!!! They eat together, attend “balls” together, and talk about hardships. I liked this film a lot! The day before yesterday was my first day back to cleaning up after students. It was terribly hot and humid (more so in the school than outside) and I promptly got a gross warm-weather cold; all stuffy in the head! I’m back to working late nights. Overall, it will be good to get back to it; right now it feels awfully lonely. The cool thing about having been writing here for over a year is I can go back and find out what I wrote, at this time last year. Here’s what it was. I’ve been thinking lately that I’m writing lots about trans and queer identities and experiences (awesome! ), but that I’ve been ignoring the other half of my moniker. So, I’m going to start a new series, from time to time, that highlights portrayals of janitors in movies, TV shows, books, whatever. I’ve been meaning to do this for a while! 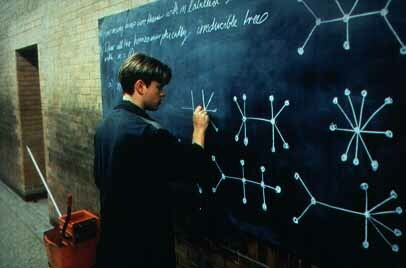 First up: Good Will Hunting. 1997. Directed by Gus Van Sant. Screenplay by Ben Affleck and Matt Damon. The first time we see Will, he is mopping a hallway floor. The movie people might have wanted to get a janitor-consultant for this movie (haha), because he is doing it all wrong. Will is pulling the mop straight out of the bucket and slopping it all over the floor (without wringing out the excess water ahead of time.) Completely unrealistic. Also, the hallway is full of students, which is not an ideal time to pull out the mop. Talk about slipping all over huge puddles of water en masse! have a chance at the opportunities you have here. floors are clean and the wastebaskets are empty. That's real work.